A confession: I lose recipes constantly. When I work on a dish, I quickly scribble it down on a sheet of paper and “file” it away in my kitchen. The filing system is actually in a three ring BBQ cookbook that is supposed to temporarily store recipes until I can properly file them away. I started it more than seven years ago and no recipes have been filed away. Ever. Enter a craving for pasta salad on a scorching hot day – much of what September has been here in San Diego. 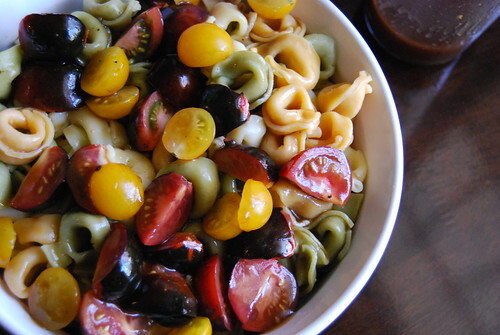 The pasta salad incorporates cheese tortellini and cherry tomatoes mixed with balsamic vinaigrette. It’s a simple dish that was introduced to me by my good friend, Ani of Confessions of a Foodie. It’s a tried and true recipe that transforms any dish: pasta, salad, etc. into a savory masterpiece. It’s my go-to meal that I make in advance and store in the refrigerator for a fast, refreshing bite. The balsamic vinaigrette is such a simple recipe that I often forget the amounts needed or the one sole ingredient that tries it all together. And I admit I’ve contacted Ani more than once to give me the recipe after losing it. Instead of filing it away only to be lost again, I’m posting here for prosperity. 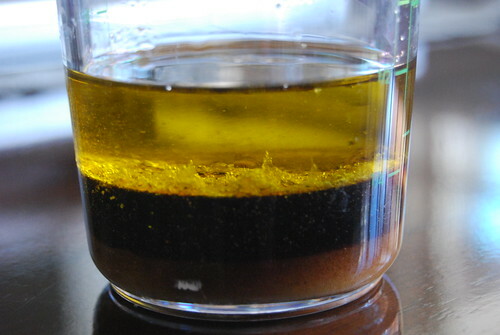 Combine all ingredients in a small bowl or salad shaker until sugar dissolves. Pour over salad or cold pasta. Store in refrigerator when not in use. I was always forgetting recipes and ideas for my blog so I bought a journal and keep it in the kitchen on top of the microwave with a pen. I write down my recipes as I cook, the blog ’em later! That’s a great idea! I think I may have to borrow that idea and do that myself. Sure beats losing a piece of paper. Thanks! Ah! Emailing recipes to myself would seem like the next logical step but I figure I would go your route and just consider myself spam!! I totally make recipes again from things I’ve posted about since I lose recipes all the time, too. Or I don’t write things down. And I don’t measure… geez. I need a kitchen journal, too! I’m in good company. Time to go journal shopping! I have all those ingredients! How simple. SUPER simple. Plus you can slowly adjust the measurements to fit your taste. Okay — you and me both! In fact this whole issue is what I woke up and decided to take care of today — organizing my recipes. So this one is being “filed” at Evernote 🙂 And I’ve been experimenting with EverClip which automatically sends everything to Evernote. Voila! (hahah — which me luck!) 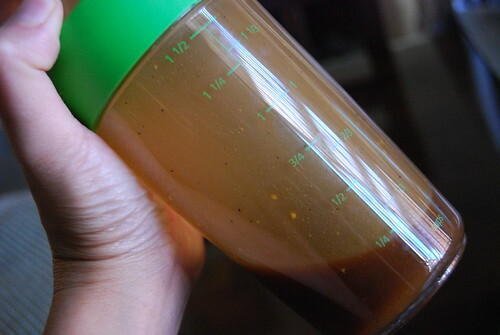 And thanks for sharing this vinaigrette — always looking for good salad dressings to try.